Discussion in 'E-Sports Hockey League - Xbox' started by LG McDonald, Feb 6, 2019. 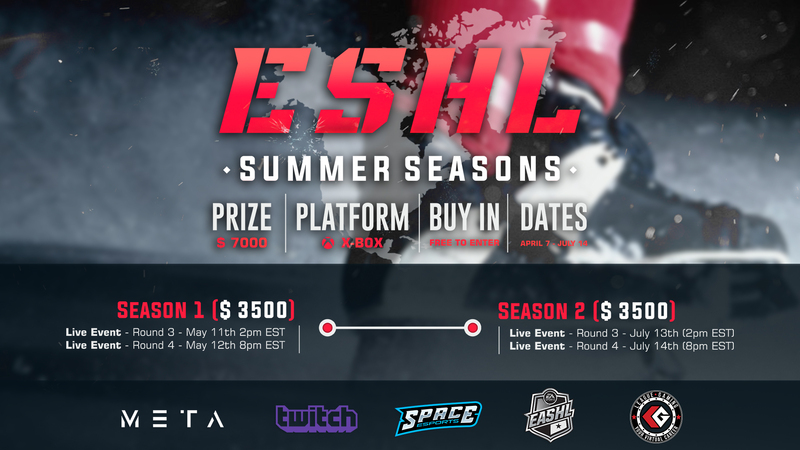 Leaguegaming and Space Esports are teaming up to showcase the best of best from the world of 6v6 Hockey! This event is an Xbox Exclusive event that will begin with a three week, 24 game season followed by a four round playoff. Here are the rules and format for this Event! This is an Xbox exclusive event. All players who are NOT currently under a league ban, capital ban, or have an outstanding ban fine to pay out are ELIGIBLE to participate for this event. Players MUST be from Canada or the USA to participate. Players are ONLY eligible to play for ONE TEAM for the duration of this event. Team registration is handled by the team "owner"
Team Owners will represent the organization for the duration of the event. Team owners are to ensure EVERY GAME his or her team participates in is streamed! Team's are NOT eligible to use trademarked team names and branding. Round one, two and three are best of five. Finals are Best of seven. "Make your own schedule" for the first two rounds due to holidays and the time of the season. The player must NOT have been ON another team roster for the duration of this event. The deadline which locks a player to a set team for this event will be 8 pm EST of the opening Sunday Night of the event. Teams are NOT eligible to sub a player BACK onto their roster who was previously on the roster AFTER the deadline stated above for opening night. All games will be handled via the EASHL Club Challenge System. The home team listed on the site will have home ice for the game play. Teams are given 10 minutes from OFFICIAL GAME; IE 9:10-9:40-10:10-10:40 to ensure their complete six skater roster is in the dressing room, and actively searching for their opponent. To contest a forfeit a stream MUST be provided, including time stamp references as to when the team in question was in the dressing room and when the search began. If there are game connection issues IE "dressing room" errors it is expected for both team to work together, try a new host etc to ensure the game gets played. If one team is currently in overtime or had a delay to their previous game, the team who is waiting and ready is ineligible to take a forfeit. Once their opponent is completed their first game, the ten minute clock will THEN begin from the current time that the team completes their game. IF a team forfeits 25% of their games in this event, EVERY PLAYER listed on the roster will be issued an LGHL BAN which will prevent these players from participating in future events and remove them from current events and leagues until the ban expires or the fine is paid in full. Also, every win this team has will be overturned to a 1-0 regulation loss. Rosters are made up of eight(8) skaters with no positional lock. Teams are eligible to roster sub players in and out of the line as often as required prior to the game beginning. If the game begins, and a player loses connections and cannot return, that player can be roster subbed out of the game. When a roster sub occurs, the team making the roster sub is also eligible to adjust their line. EX: if the Center loses connection and cannot return to the game, the Left-wing from that same game is eligible to move to center allowing the roster sub player to come in and play in the Left-wing position. In the situation whereby a player loses connection, "lags-out", the play WILL continue up until the very next stoppage in play. ALL plays - goals, penalties etc - up until the very next stoppage in play COUNT AND WILL BE HONORED! Once the stoppage has occurred, BOTH TEAMS are to have their goalie leave the game session which will prompt the game to end immediately. Upon the game restarting, at the opening face-off the team in which had a player lose connection to the game shall win the face-off and maintain possession of the puck. That team will retain procession of the puck until the in-game score clock reaches approximately the same time in which both teams left the previous game. At that said time, the team with puck procession is to take a "delay of game" MINOR PENALTY, by dumping the puck over the glass from within their own defensive zone. This penalty is taken due to the fact the team had a player lose connection during the game. The team with the player who lost connection will win the face-off upon restarting the game and maintain possession of the puck until the clock reaches the time approximately the time in which the first penalty was taken (reference the box score prior to restarting the game). At that time the player who was in the box for the original penalty will take a delay of game penalty by dumping the puck over the glass in his or her own zone. The next face-off, that same team is required to be allowed to win the draw, then they maintain possession in their own zone until the in-game score clock reaches approximately the same time in which the original game ended. At that time the player SHALL then take a delay of game penalty, by dumping the puck over the glass in his or her own zone prompting a delay of game penalty. This then will honor the powerplays prior to the disconnection as well the powerplay owned due to a player losing connection. In situations whereby a team is ON THE POWERPLAY, and has a player loses connection, upon restarting the game, the disconnection and current powerplay are a wash resulting in the game starting full strength, 5v5. In the situation whereby an equal number of players on both teams lose connection, when the game restarts both sides will remain 5v5. In the situation whereby a player has a penalty shot or breakaway and the goalie in which he or she is coming down on "loses connection" to the game, the player will be awarded a goal upon restarting the game. This is the same call made if a player has a breakaway on an empty net and is tripped. That situation does not result in a penalty shot, it results in an automatic goal. It is HIGHLY RECOMMENDED that communication between both teams during restarts be constant and documented to ensure that both sides fully understand what is required of their team. In situations whereby teams are running behind schedule, or where "dressing room" errors cause games to delay too long teams then can request the have the game moved to the following day. Sunday reschedule games will be defaulted to Tuesday, and Thursday schedule games will be defaulted to Saturday in situations whereby both sides cannot come to terms on a reschedule time. Default game time will be the exact same time the game was originally scheduled for. If both teams cannot make the reschedule, the game will be marked as a 0-0 game. ALL GAMES ARE REQUIRED TO HAVE COMPLETE STATS ENTERED VIA OUR OFFICIAL STATS SYSTEM! Reference our "How To" Thread in regards to how stat entry works here on LG. Game Night Setup - REQUIRED STREAM! Teams are required to stream each and every one of their games! a stream of the game that DOES NOT HAVE the in game commentators turned on. There are NO EASHL build restrictions for this event! Any height and weight can be used. ANY GOAL scored in-game that is deemed a goal by NHL 19 SHALL be honored and considered a goal. The event staff IS NOT reviewing footage post game of goals thereby overturning goals that have counted in game. Since it is MANDATORY that each team streams their own games, goals scored prior to a the game looping back to a time within the game where that goal does NOT official show on the scoreboard will count! In this situation, the team MUST provide video evidence showing the goal being scored and then the game looping back to a time prior to the game being scored.